Conducting a targeted phishing exercise against a company? Most likely, this company has job openings posted on an external job site ripe for picking. Resumes are typically in PDF or .Docx form, both of which are great for delivering payloads. 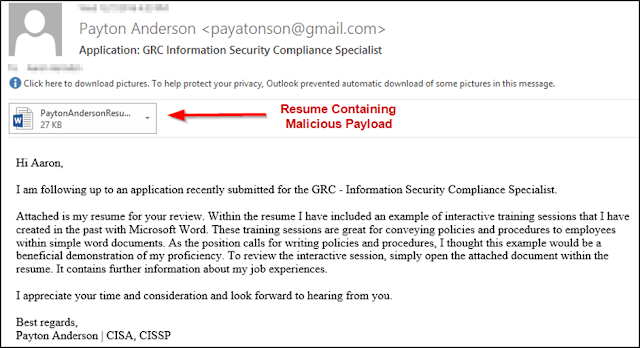 Adobe has a plethora of vulnerabilities with publicly available exploits, so if you know what version Human Resource (HR) recruiters at your target company are using, you may take this route. However, this post focuses on sending a malicious Microsoft Word Document with a batch+PowerShell reverse shell payload included. This is self explanatory. Search online for open positions at your target company. Find one that you have enough knowledge to create a resume for. My personal favorite is to apply for IT Security positions because I already have a generic resume built for such.. and because I really love subtle irony in phishing tests. LinkedIn. This is all you should really need. Simply go on LinkedIn, maybe have a fake profile and look like a reputable applicant, and find people listed as 'Talent Acquisition Specialist', 'Recruiter', or 'Human Resources' at your target company. Once you have their name, simply look on their public website for email addresses disclosed. Those email addresses should provide the format that our recruiter's email will be. For example, if the target company is Foobar.com and on their website a VP's email address is disclosed "John Doe, jdoe@foobar.com", we now know email addresses for other employees will likely be in the format @foobar.com. This is the MOST important step. 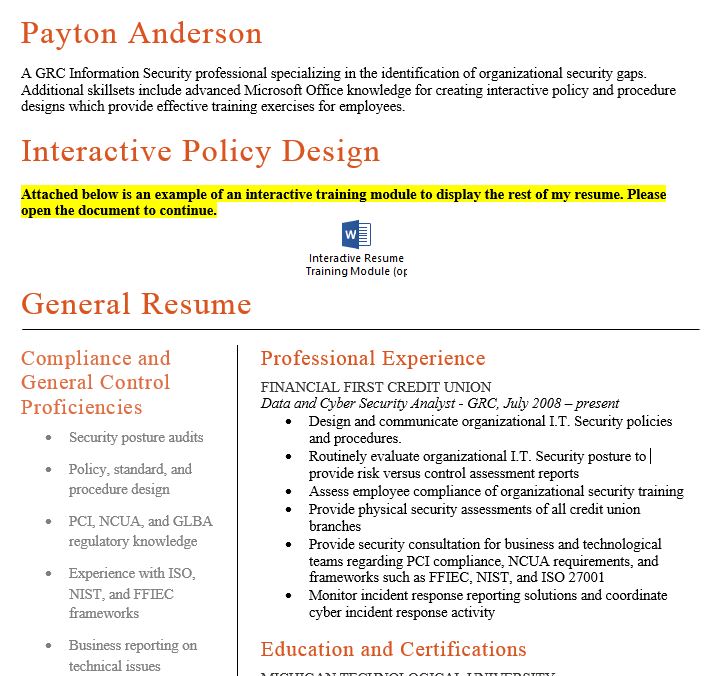 Make a resume using key details from the job posting. Create a few fake jobs. Maybe even use a few details from your personal career (I mean, this testing is supposed to be approved by the company, so who cares if details point back to yourself). The resume MUST be believable, as you are trying to trick a target into also opening/running a batch file embedded within the document. I like to include a line stating that the resume 'has an interactive' or 'creative' piece to it that can be found in the additional included document. This works especially well if your application is for a software/website/media developer position. Thank you, PowerShell Empire developers @harmj0y, @sixdub, and @enigma0x3, for making our lives so much easier. In this step, we use PowerShell Empire to generate a batch file which in turn executes a PowerShell command that establishes a connection from our victim machine back to our attacking machine. At the time of writing this post, most signature-based AntiVirus programs are not catching Empire reverse shell payloads. In this step, we take the batch file and place it into our resume using Microsoft Object Linking and Embedding (OLE). 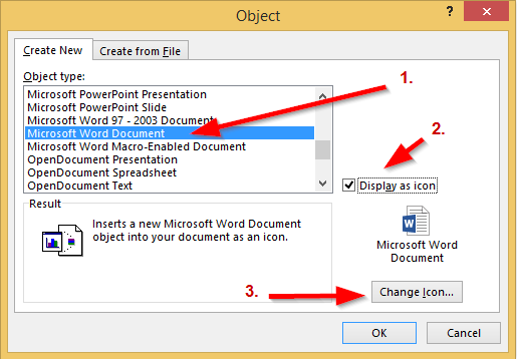 Once inserted, we can change the icon to appear like another Word or Excel document. Credit for the OLE idea goes to enigma0x3, discovered on his blog (https://enigma0x3.net/2016/03/15/phishing-with-empire/). To insert the payload.. 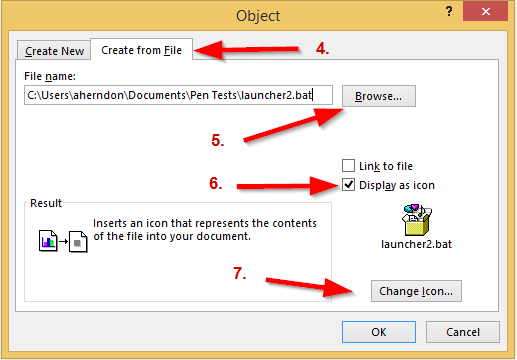 Paste the path copied in step 3 to get to the icon directory and select your icon. Viola, we should have a batch file included in the Word document, disguised as another Microsoft Word document. When opened, it will prompt the user to 'run', but often this is overlooked as a security issue and performed by users. Once the victim clicks run, you should receive an Empire shell on their host! As mentioned, if they open the document and then click 'run', you get a PowerSploit shell! This method can also be used with Macros, which are easier to trick users into enabling (in my opinion) but are more commonly blocked by email filters due to their increased use/popularity for delivering Ransomware and other payloads. As always, if you have any questions or comments for this post, leave them below!